Why Do We Need SEO Consultants? SEO consultants are a bit like political lobbyists. In a democratic society where the will of the people rules via their elected representatives in government, there really should be NO place for experts in the political process to be paid by special interest groups to get certain policies pushed through the parliament. The same can be said for SEO consultants. Search engines like Google™, Yahoo™ and Bing™ have a self set mandate to deliver the most relevant results relating to the billion or so searches performed online each and every day. So why do we “need” SEO experts to show us how we can entice these search engines to display one result ahead of another? The answer……. MONEY. Almost half of online searches using a search engine involve a user searching for a product or service they wish to purchase. In almost all cases there are multiple suppliers providing those products and services so it stands to reason that the supplier who displays higher in the search results will get more customers. Regardless if you are searching for a business which does Women’s T-Shirts, or does Glass Washer Service in Melbourne or Granny Flats Sydney, statistics tell us that as long as the search engine results are relevant you will probably call the business(s) which display higher first. Search Engine Optimisation consultants are paid to help your business display higher than your competitors on the major search engines. Just like political lobbyists who know who to approach and what to say, SEO consultants (good ones that is) know what you need on your website to make it more search engine friendly than your competitors website. There is of course a much easier way of appearing on the first page of the major search engines. Sponsored links can have you on page one within hours BUT there is a cost. Pay Per Click advertising (AKA AdWords) allows you to bid an amount of money you are prepared to pay every time someone clicks on your advertisement. Many businesses rely on Pay Per Click (PPC) advertising to generate their online traffic but one must be careful to maintain an acceptable ROI (return on investment). Again, most SEO consultants can help you with this type of online exposure. As many of you know by now Google have introduced the next stage of their Google Maps development called Google Business View. Essentially this feature is designed to extend / enhance the user’s search experience by allowing them to virtually enter your business premises and have a look around. The logic here is both sound and well researched. Imagine if you will walking through a shopping centre with hundreds of shops when a shop which you are interested in catches your attention. What do you do? You walk in of course and have a look around. If you find something you want to buy you buy it and leave the store. Google Business View allows you to enter a shop and browse around at your convenience. If that shop has something you want to buy AND they also have an E-Commerce facility you may then click through to their online shop and buy your item. The beauty of the Google Business View system is that it can apply to virtually ANY business, even a home business. It doesn’t matter if you have a mechanical workshop, a car dealership, a restaurant, coffee shop, factory, office or warehouse. A virtual walk-through can increase the appeal of your business exponentially. I recently spoke to a plumber whose has a small home office and 3 vans. His dilemma was “how can Google Business View benefit me”. Yep, you guessed it I had an answer for him. I suggested he take some photos of recent jobs he has done and get them blown up to poster size. Then put these posters up around his small home office and get the Business View surround photography to include his posters. Genius right? Yes, you have to pay your selected photographer a fee to shoot the photos and that fee will depend on the physical size of the shoot. The fee is also a private matter between you and your photographer and no one else. 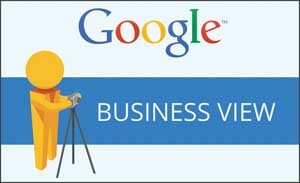 So do yourself AND your business a HUGE favor and get Google Business View BEFORE your competitors. If you’d like more information drop an email to theo@nobsseo.com. It is no secret that search engines like Google, Yahoo and Bing place a great deal of importance on the number of RELEVANT links pointing to your website. This in turn is a major factor in a search engine determining the importance of your website and therefore how high in the search results your website will appear. In other words links are very powerful Internet Tools. You will notice the word RELEVANT is in caps and there is a very good reason for this. Many people are of the belief that any link is a good link and the more links one has the better their website will rank. Not True. Search engines use very sophisticated algorithms to determine the relevancy of links pointing back to each individual website. Irrelevant links get a very low if not zero score while relevant links get a very high score. For example if you are a Locksmith and your website is linked to by other websites in the security / alarm / lock categories then those links will be seen as high value links by the search engines and in turn will increase the perceived importance of your website. There are many ways of getting relevant links to your website. For example, if you are in business ask your suppliers to include a link to your website from their site. The same goes for your customers who may have relevant websites to your industry. Search out relevant Blogs and Forums. Find those which you can genuinely make a constructive comment on and make sure you include a link to your website. Great care should be taken NOT to spam blogs & forums but rather to use them to contribute useful comments. Remember the people reading your comments will soon realise if you are genuine or just a spammer and will judge you and your business accordingly. Business directories are also a great source of relevant links but make sure your business is listed under the correct category. Remember the word RELEVANT and always try to secure these types of links. You Tube….. Just Film It! Can you believe that just ONE You Tube video was watched over 120 million times during 2009? Another 36 million times and yet another over 33 million times. You Tube was the 3rd most popular website visited by Australians in 2009 and guess what? Most businesses DON’T have a presence on it. In fact only 2.7% of businesses have taken the time to upload a video promoting their goods or services on You Tube. Could it be the cost? Nope, You Tube is FREE. Maybe it’s too hard to upload a video. Ummm nope again. You Tube signup and uploading is very easy. Okay so maybe it’s just too hard to shoot a video. Mmmmmm let’s see. You’re smart enough to run a business but you can’t aim & shoot a video camera? Or, you don’t want to invest a small amount and get a pro to do it for you. So, let’s get down to the REAL reason your business doesn’t have a You Tube presence. “TO-IT” For the vast majority of businesses You Tube is a ‘TO-IT”. In other words it’s something which you will do when you get around to it. Trouble is we all know what happens to projects which are in the “TO-IT” basket. We rarely get around to it and it often never gets done. So girls and boys here’s your pearl of wisdom to finish off 2009. Dust off your video camera or call a video production company and get a video promoting your business on You Tube. Here’s an extra tip. Include a link to the You Tube page displaying your video on EVERY single email you send in 2010. Why is EMAIL so important to your business? Despite the proliferation of spammers, scammers and idiots online the fact remains that email is one of the most powerful tools available. The biggest problem email has however is that it’s free! Like most free resources email is subject to abuse by people who are intent on stealing money, misguiding others and of course the idiots who have nothing better to do than find new ways of abusing a free resource. Most businesses who have a website also have an email address(s) attached to that website which is often facilitated by their Internet Service Provider (ISP). These email addresses also identify the website (business) which they belong to (eg. info@exampleptyltd.com.au). The quality of these email servers depends entirely on the integrity of the ISP. For many years now the biggest problem with email has been SPAM. In most cases spam consists of an unsolicited marketing email usually sent to your email address by someone who has purchased an email list from a bottom dwelling scum-sucker who has “raked” email addresses from the internet. There are many companies around the world who sell these lists to anyone who wants to pay for them and generally they are quite cheap. (Tip: never ever buy an email list. If you want to do an email marketing campaign use a reputable company with a verified opt-in email list or create your own opt-in list). So, who are the BEST email providers? Our testing and surveying of Australian businesses has come up with the following email providers from BEST to WORST. For those who use Gmail, the number one position is no surprise. Owned by Google and featuring some of the best deliverability and security features imaginable Gmail totally “owns” the number one spot. Big Pond and Optus, to their credit, have really lifted their game over the last 2 or 3 years. Both of these operators have taken a “zero tolerance” stance on spammers and scammers and they continue to improve their deliverability percentages. In my opinion Hotmail & Yahoo Mail / YMail are still off with the fairies when it comes to spam / scam / deliverability. Try looking at the source of the last 10 spam or scam emails you have received, especially out of Africa, China or India. Chances are they have a Yahoo or MSN email address. Of the 9 million+ Australians using the internet every day over half of them are looking for a product or service in their local area. It is a very safe assumption that a percentage of these people will use EMAIL to contact the business(s) of their choice. You as a business person owe it to yourself, the customer and your staff to make every effort to receive each and every legitimate email sent to you, period! If a customer’s email doesn’t reach you, or your reply to that customer isn’t delivered, chances are you can bid that customer goodbye. Worst still you will probably never know that customer even existed if you didn’t get the original email. That’s why “Deliverability” is important. Yes it does take an good hour to set up a new email provider and customise email folders, signatures etc. So what? It’s your business, your potential customers and your future. Don’t risk a bad email provider.